On the side of the engraved Cinema. Model is characterized by the original disk in the form of film reel, the lower level of which resembles concentric circles folded film. Hand made false numbers and text performed classic font style art deco. The novelty comes on a black silicone strap with textured film. Watch the “Kino” Cinema released in a limited quantity of 150 copies. 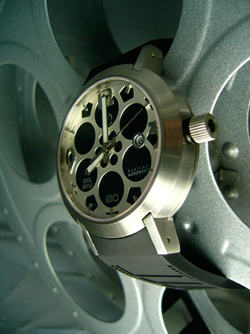 Buy watch The “Kino” Cinema is available with company officials Morpheus costs $ 1,950. The second novelty is represented by HR Giger “Passagen”, also released in a limited quantity of 150 copies, operates on a Swiss-made quartz movement ISA. Unique, industrial-themed design is based on a series of paintings Passagen popular Swiss surrealist artist and designer HR Giger.